I want to become an online entrepreneur! I read your inspiring story in More Magazine about the "empty nest" syndrome and all the ideas you offered about the variety of different opportunities available on the internet. That story was hilarious by the way and really got me thinking about what the options I have instead of wandering around this big empty house now that my children have gone off to college. Well, after reading your story I plan on reinventing myself. I'd like to start my own ecommerce website and become an online entrepreneur! It has such a nice ring to it, doesn't it? Online Entrepreneur. I'm going to become an online entrepreneur! As you suggested in your Cyber Baby article, I want to transform my passion, which is folk art painting, into an online web business. I have researched this "niche", (see I've even started to learn some new terms! ), and know that I can build a website that will blow the others out of cyber space. It will be so exciting to express my inner artistically inclined child on the internet. I plan to not only sell my own patterns and designs but to sell my completed folk art pieces as well. I also plan to offer instructional videos on different folk art painting techniques, write my own simple how-to ebooks, and sell folk art supplies. I have already started to research competitor websites, a variety of different affiliate opportunities and have established the beginnings of an outline for the folk art website. 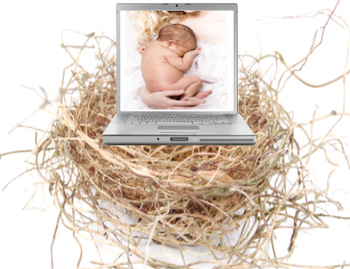 Once my new cyber baby begins to grow and develop, I know that a whole new virtual world of opportunity is going to be delivered to my lonely, boring empty nest! Well, I am wishing myself luck that I'm a winner. Actually, I already know that I'm a winner, but it would be ever so lovely to win a free website too! I don't know what to say except that I have enjoyed reading. Nice blog.